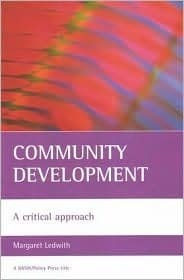 I loved Margaret Ledwith’s book, Community Development: A critical approach. This has been my practice for so long alongside community organizing and then on its own — I can’t describe the feeling of reading something that resonates so strongly, that frames this kind of work within this academic context that sometimes feels so alien and this British context with its very different trajectories. All that, and offering new insight. I’m working on the next paper, which is on this kind of work in London, so there will be a couple of posts on this, though the paper is actually almost done. Should have been submitted ages ago. And the kind of practice I prefer instead. And a final note on how things change, on how static models are never enough. It emphasizes to me just how much depends on individual practice and ability to be flexible, to adjust, to do what’s best given the situation. To change the world, which is the point, not just to get the model right. Always hard, both to do, and to teach. We come to the 1980s. Thatcher and the New Right, the return of the distinctions between deserving and undeserving poor, the active dismantling of the welfare state. New Labour also moved towards ‘we are all on the same side’ and away from commitment to structural change or analysis of injustice and inequality — they also embraced zero tolerance policing, punitive approaches to asylum seekers and fines for ‘anti-social behaviour’. (21) Hardly surprising that the radical agenda became less effective in this period. All that before we get to the Big Society under Cameron (and Clegg), their transferring responsibility to community while implementing austerity. Some good stuff on what a bad idea that is. Gary Craig’s work critiquing this move, move away from critical position. And of course, praxis has developed quite a lot despite such conservative decades, and so our work needs to be imbued with critical analysis around intersections of race and class and gender, also with sustainability. 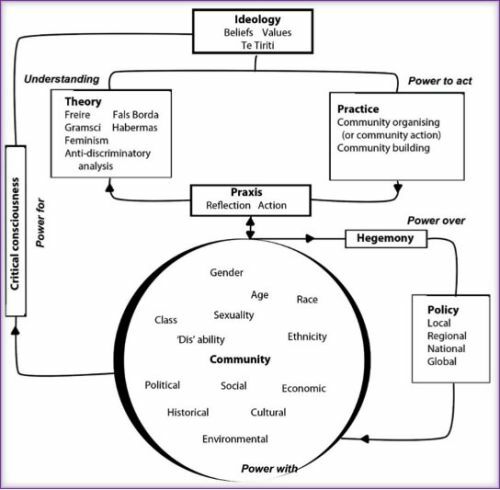 She gives a model here for critical praxis, locating internal and external forces in the community and working through how they impact on people’s lives. I like these drawings. That said, I sometimes stare at them quite a while trying to work out quite what they mean. This chapter opens with a focus on Paulo Freire, so it’s covering much of what I know though I appreciated the discussion of the feminist critique of his work. It did feel a bit like Freire in all of his imperfections became a bit of target, when what I like about his work is that the whole point is to facilitate a collective learning and collective liberation to avoid being trapped in any one individual’s blindnesses. I feel it is the establishment and academia that sets individuals up as super philosophers only to be torn down, and that’s more a fault of the system if any one individual is given so much power. Still, the critique is just, I just wish we could be more generous with each other. Anyway. The more I stare at that quote the more I love it, I’ve been thinking about fiction and non-fiction for a while. That captures something important. I love this, all of this. Without the link between person and political, Ledwith writes, stories remain subjective. She gives insights form Chris Cavanagh’s practice of using storytelling for social justice. In fact, there are so so many good examples about narrative and storytelling and justice… they’re on a list now. My to read list is absurd, I shall have to retire early. creating new ways of being in the world (ontology). She writes about Rowan’s ‘Dialectical paradigm for research’ (1981), which sounds amazing, you can never be too dialectical. I’ll read that and write more, it’s already on the stack. This chapter includes checklists and questions (these are throughout, and so damn useful, meaning this will be a well-thumbed book once research is underway). Everything she quotes from this foundational text by Reason and Rowan sounds pretty phenomenal. She combines this with Schuler’s core values model, to help pay attention to the balance of needs while you are busy doing everything else. All these tools I never knew of. There’s the Scottish ABCD model as well, also to be explored. There’s more on organising, on Saul Alinsky…but there I have written far too much. I shall stretch towards the new. this process is so important, because otherwise collective action can simply lead to taking power without a critique of how power operates, which makes it easier to abuse because that is, after all, the dominant model. Critique also has to stretch towards a global view, developing understandings of how it is all linked. This chapter ends with lots of case studies, they are dead useful. Gramsci! You can never have too much Gramsci. The key ideas of hegemony, the personal as political and the role of intellectuals. The importance of challenging dominant and damaging forms of common sense supporting the dominant system, particularly around race and patriarchy. So if you read your Gramsci you know that empowerment must therefore be connected to conscientisation. So what do we need to challenge it? Transform it? Conscientisation. And I think she’s right. But there’s lots more to say about that. It is interesting how much this resonates with Boaventura de Sousa Santos as I finish his book, so many people working along similar lines for so many decades and, I think, never in real contact. But drawing on many of the same ideas I suppose. Makes me feel like we’re on the right track.